The first encounter was way back in May 2011 when all I can think of is my homeboy Tyler Florence munching on BLT’s Prime Popover in an episode of Best Thing I Ever Ate. And so of course I had to make my own. It was as easy as making pancakes but in a muffin pan. But my heart sank when I saw the tops were not perfect thinking I messed up. And then I found out that they’re not supposed to have perfect rounded tops and felt silly for being disappointed for nothing. 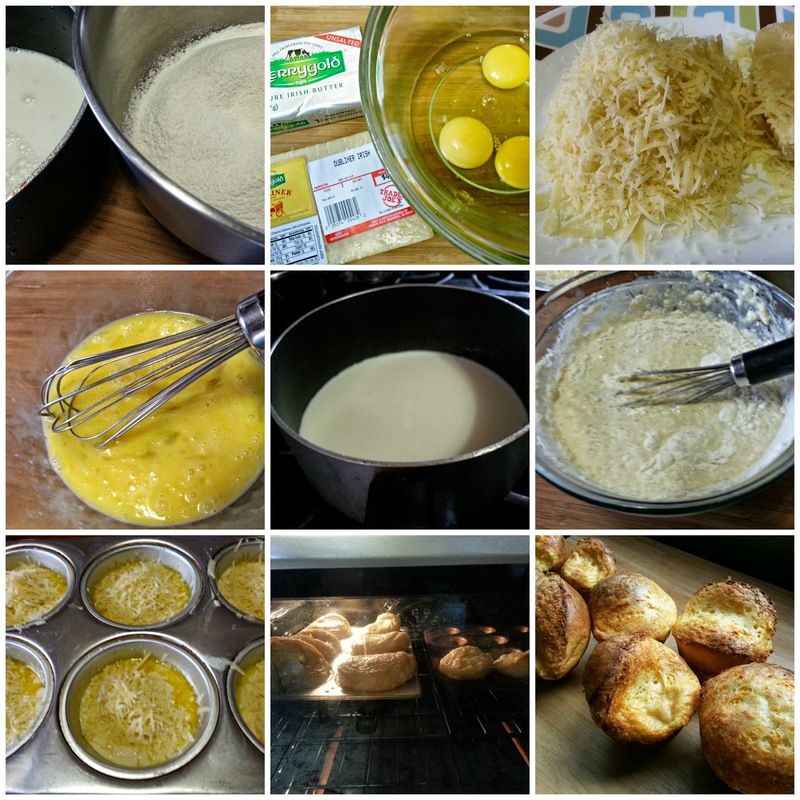 Today, after more than two years, I revisited the crusty, airy and buttery rolls (sort of) with a couple of modifications. This time I used Dubliner instead of Gruyere cheese. I think it tastes better because the first is not salty- in fact, it has a hint of sweetness but has that aged Parmesan bite into it. I also used Irish butter to match the Irish cheese although that's not necessary- any unsalted butter will do. 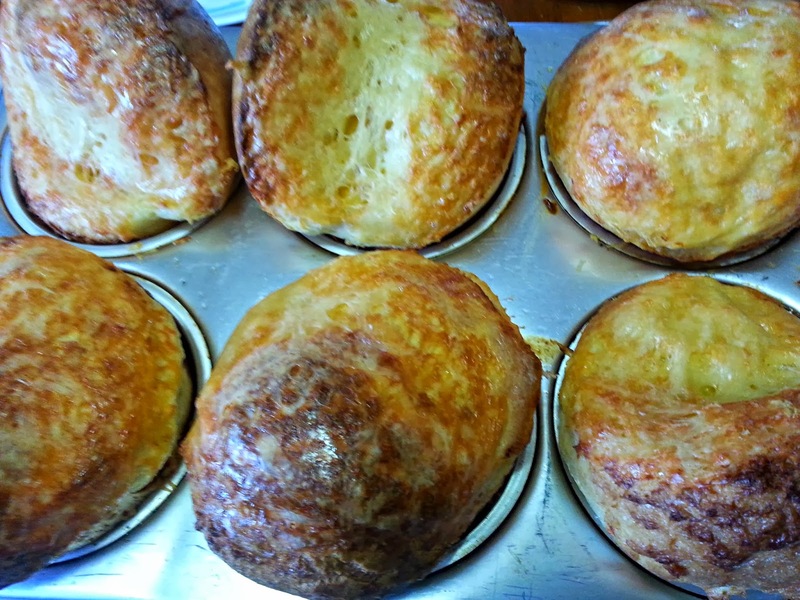 My recipe yielded only 9 popovers because I used my jumbo muffin pan with six cavities and 3 regular sized ones. While waiting for them to puff I was a little nervous. What if the jumbo ones fail to puff? But they did! The kitchen smells cheesy wonderful! 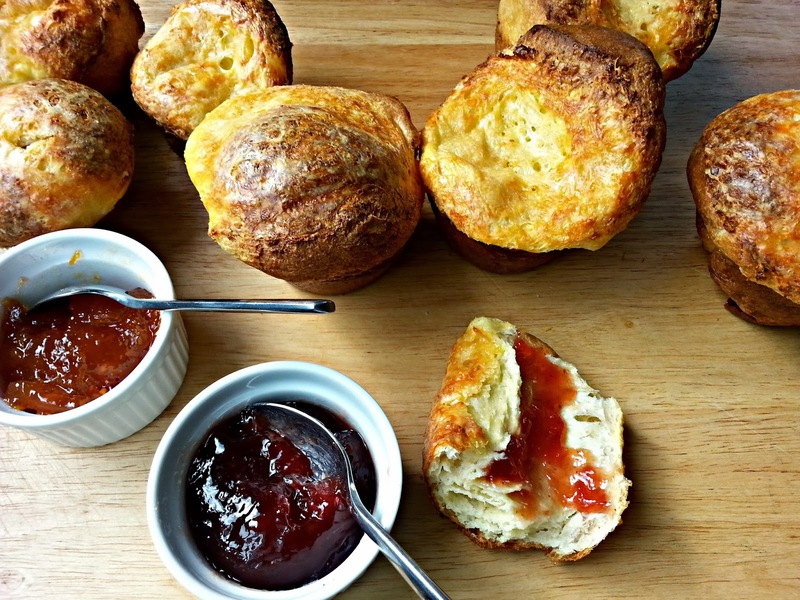 The popovers need to be poked with a sharp knife to release the steam. This will help keep its shape and texture even as it gets cold. I did not do this the first time I made them so they deflated after a few minutes. Now I know better! This is how it looks when you break one apart- there's a hollow and it's more of a flaky crust encasing very little "meat"but in a delicious cheesy way! 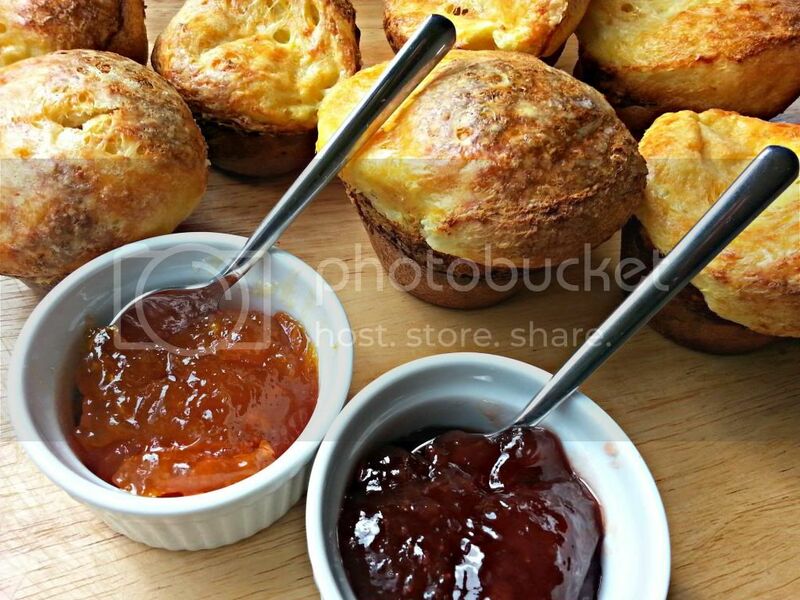 Serve it with your favorite jam any time of day and you'll love every scrumptious bite! 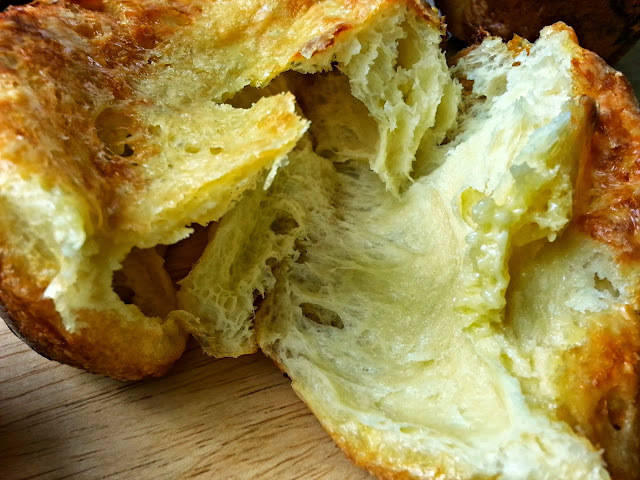 Place the popover pan in the oven. 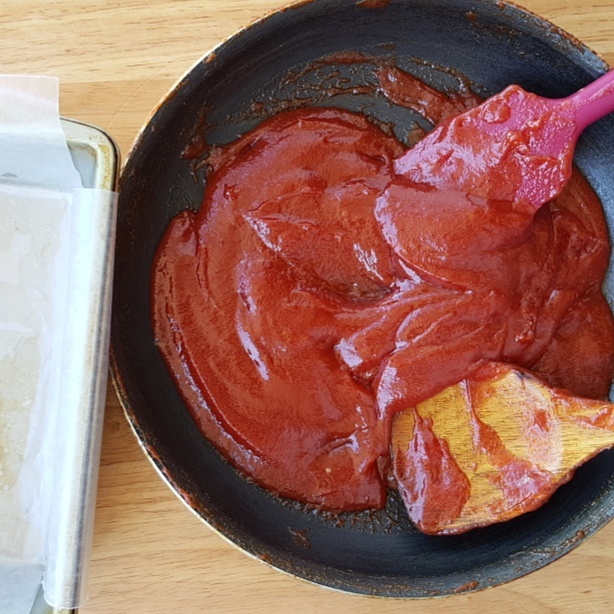 Heat the oven and pan to 350 degrees. Gently warm the milk over low heat and set aside. Whisk the eggs until frothy and slowly whisk in the milk (so as not to cook the eggs). Set the mixture aside. Sift the flour then slowly add to the wet mixture. Gently combine until smooth. Remove the popover pan from the oven and using unsalted butter grease LIBERALLY the top as well as inside the cups. 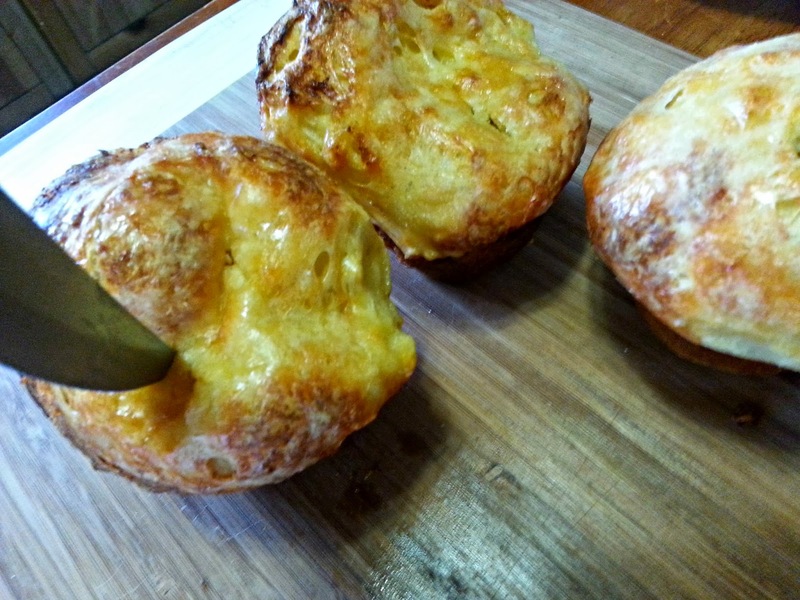 While the batter is still slightly warm or room temp (definitely not cool), fill each popover cup 3/4 full. Top each popover with approximately 2 tbsp of the grated Dubliner cheese.